Ten days to go now – so let’s catch up with the winners and losers from another day on the trail. RTÉ - who found out that last night’s leaders’ debate pulled in an average audience of 961,000 people – well over double the number who watched Eamon Gilmore and Micheál Martin square off last week. 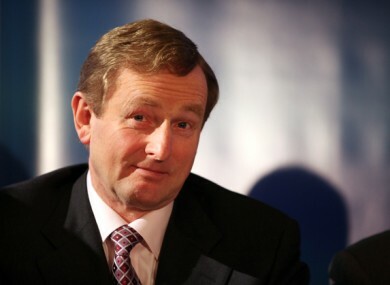 Enda Kenny - who is now virtually unbackable to become the next Taoiseach, following his performance last night. Labour - which topped a new poll of Dublin voters commissioned by the Evening Herald. Its 31 per cent beats Fine Gael’s 29, with Sinn Féin on 11 per cent and Fianna Fáil on 10. Michael Conaghan: The Labour candidate in Dublin South Central has found himself at the receiving end of ire from the Rubberbandits, who aren’t too pleased about how Conaghan’s campaign song (which, Conaghan says, doesn’t include his voice) uses the music from ‘Horse Outside’. RTÉ: Well, there’s ups and downs. Green Party communications minister Eamon Ryan wants to revamp the licence fee system, and replace it with a contribution towards broader news content – which would see RTÉ have to give up a 16% share of its current income. Enda Kenny, pictured above at the launch of his party’s manifesto by Stephen Kilkenny this morning, looked quite obviously smug with himself after the Irish Daily Mail’s headline said what most of us were wondering: If you’re that good in debates, why did you miss the first one? Tweets about Gerry Adams outnumbered those about any other leader in the last few hours, according to our Twitter Tracker – but the majority of them were negative in tone. Thankfully for him, though, there’s one leader who’s gotten even worse coverage in the same period: his sparring partner from last night, Fianna Fáil’s Micheál Martin. Feedback on “Daily Fix: Tuesday”.